Its no secret I hate the cold. If I could climate control my life to 70 degrees I would be soooo happy. I am not use to it being anything below. This polar vortex crap is for the birds polar bears. I've been thinking of ways to stay warm. If it helps here are 5 things I may resort to if it doesn't warm up soon. 1. heating pad/personal heater. The personal heater is under my desk at work and the heating pad follows me around at home. If I could find heated socks I would be super happy. I am also purchasing an electric blanket tomorrow. My parents would never let me have one growing up. They thought I would catch myself on fire. While that may still happen, at least I will be warm. 2. Feety Pj's. Actually I am pretty sure I am buying myself some tomorrow. As it is I am sleeping in fleece pants, fuzzy socks and a Tennessee hoodie. 3. Fleece pants in public. I have stopped myself so far but I don't know if I can hold off much longer. If I do,you have permission to people of walmart me. I will have officially hit rock bottom anyway. On a side not fleece PJ pants are super comfy and even with my holiday weight gain I can squeeze into a small. So it boosts my self esteem. 4. Shaving my legs. Or rather not shaving my legs. It may not seem like a lot, but to me its a second layer of insulation. 5. 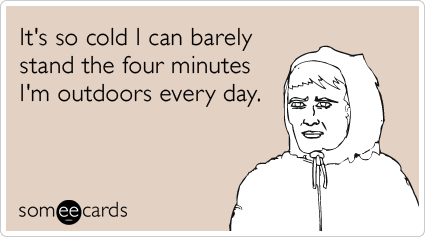 Cranking the heat up to 80 and not leaving the house until Spring. Why oh why can I not work from home? Hope everyone is staying warm. If not try my tips and let me know how they work. I warm up my bed with a heating pad every night, meanwhile the fan is on high blowing on my face. I did turn my heat up to 74 last night and probably for tonight, not leaving the house and wearing fleece PJ pants all day is a great work from home benefit. 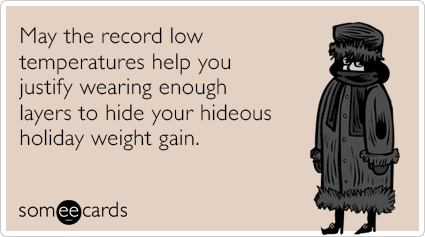 bahahaha the last e-card. Love it. Seriously my footed pjs are the greatest thing ever. I love those suckers, they are so warm! Buy them. Wearing lots of clothes at once (like 2 pairs of pants minimum) and cuddling with whoever will let me cuddle with them is my usual strategy!